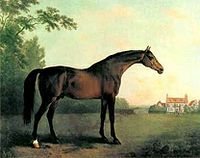 The title of champion, or leading, sire of racehorses in Great Britain and Ireland is awarded to the stallion whose offspring have won the most prize money in Britain and Ireland during the flat racing season. The current champion is Galileo, who achieved his ninth title (and eighth in a row) in 2017, when his progeny won over £15 million in prize money. Unlike the similar title for leading sire in North America, the stallion in question does not need to have resided in Great Britain or Ireland during his stud career, although the vast majority have done so. Northern Dancer is the most notable example of a North American-based stallion who won this title. The Northern Dancer sire line has dominated the list for the last several decades, mostly through his son Sadler's Wells (14 titles) and grandson Galileo. Year Champion stallion Winning horses Total wins Total prize money Leading earner Runner-up stallion Ref. ^ "Northern Dancer (horse)". American Classic Pedigrees. Retrieved 13 September 2017. ^ a b "Champion Sires in Great Britain and Ireland". www.highflyer.supanet.com. Archived from the original on 6 March 2016. Retrieved 29 April 2017. ^ a b c d e f g h i j k l m n o p q r s t "Bloodstock | Racing Post". Bloodstock.racingpost.com. 2012-02-15. Retrieved 2017-04-29. ^ a b c d e f g "Sadler's Wells". Bloodstock.racingpost.com. 2012-02-15. Retrieved 2013-09-15. ^ a b c "Danehill". Bloodstock.racingpost.com. 2012-02-15. Retrieved 2013-09-15. ^ a b c d e f g h "Galileo". Bloodstock.racingpost.com. 2012-02-15. Retrieved 2017-04-29. ^ "Danehill Dancer". 2012-02-15. Retrieved 2013-09-15. ^ "Galileo Claims Ninth Sires' Championship". www.thoroughbreddailynews.com. 2017-12-29. Retrieved 2018-02-21. This page was last edited on 12 November 2018, at 19:11 (UTC).